The Royal Wedding of Prince Charles and Camilla Parker-Bowles on 9th April 2005 is just one of a very long line of weddings that have been held at the Guildhall venue. More recently the first gay civil partnership ceremonies have been held at the Guildhall, most notably in December 2005 between pop star Elton John and his partner David Furnish. The building of the present Guildhall dates from 1687. It was designed by Sir Thomas Fiddes (not Sir Christopher Wren, despite what you may hear elsewhere) . Unfortunately Fitch (or Fiddes) died before the building was completed and it was supposedly Sir Christopher Wren who oversaw the completion after two years. 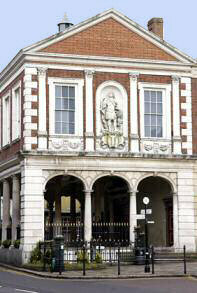 The Guildhall at Windsor originally cost around £2,000 to build. 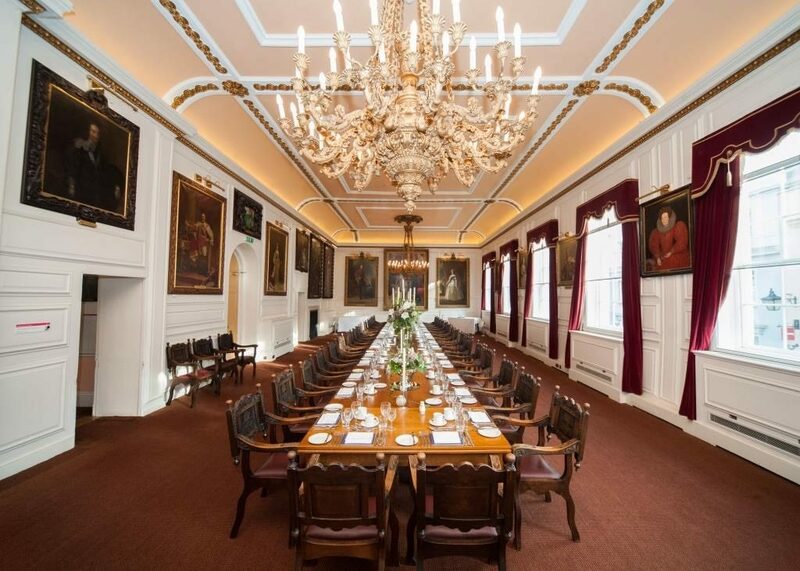 The building has an open ground floor where a corn market was held, with a number of meeting rooms upstairs, supported on columns and arches of Portland stone. However the four columns in the middle of the Guildhall are purely decorative, having stood for many years supporting no weight from above. The legend is that the town burghers demanded the extra supporting pillars for safety reasons despite Wren’s assurances that none were needed. Eventually the client had his way and the four pillars installed, but Wren had the last laugh, leaving a gap at the top so they didn’t actually support any of the weight of the ceiling above. 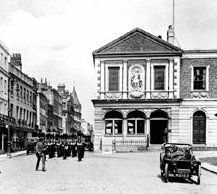 Here is a photo of the Guildhall from the early 1900s. As you can see the roads were quieter then. The guards marching down to the barracks from the castle can still be seen in Windsor. The Changing of the Guard (officially called Guard Mounting) takes place on alternate days at 11:00am (weather permitting- it is awfully difficult to march in a wet busby) except Sundays. 100 years ago when the First World War broke out, Windor’s recruiting station was at the Guildhall. In the Second World War it became the place for people to get ration books and gas masks. However, today the place is mostly used for ceremonial events. At weekends the staff at the Guildhall will often be happy to show you upstairs if they are not too busy. 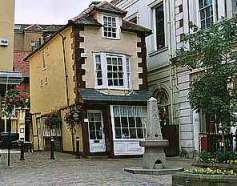 Next door to the Windsor Guildhall you will find the amazing Crooked House (more correctly called Market Cross House) which has stood for almost as long as the Guildhall, despite warping (they built it using unseasoned Oak) that gives is the most peculiar appearance. The sensation of being inside a building where there isn’t a right angle in sight is and excellent way to end off your visit to the Guildhall. The current Market Cross House was built in 1687 and started to lean around 1718. There was once a secret passage from the basement of Market Cross House right through to Windsor Castle.